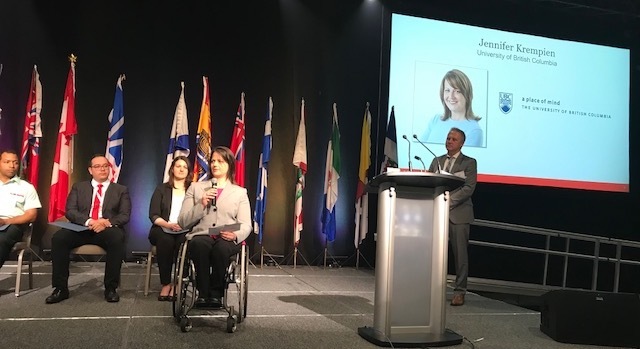 Master of Health Administration candidate Jennifer Krempien has been awarded the 2018 Robert Wood Johnson Award at the National Health Leadership Conference in St. John’s, Newfoundland. The Robert Wood Johnson Award was established in 1956 by Johnson & Johnson, and is presented to one student from each of the six Canadian universities offering graduate programs in health services administration. The award recognizes outstanding student achievement. Jennifer embarked on her journey in healthcare leadership when she accepted a temporary role as the Professional Practice Leader supporting Clinical Nutrition Services at BC Children’s Hospital and BC Women’s Hospital + Health Centre. She was convinced that her career path would focus on research and academia, and the Professional Practice Leader role would confirm that presumption, encouraging her to make the switch from clinical practice to research. It did not take long before Jennifer found her passion for supporting teams, system transformations, quality improvement, and healthcare operations. This realization transformed into a Clinical Project Manager role with the BC Children’s and Women’s Redevelopment project where she led the planning and implementation of the two new clinical supports program – a dedicated milk handling service for BC Women’s NICU and a Medical Equipment Depot. Jennifer is currently the Program Manager, Inter Campus Operations at BC Children’s Hospital and BC Women’s Hospital + Health Centre leading a variety of clinical support services. She is passionate about creating cultures of excellence and transforming processes and systems to provide efficient and effective patient service. In addition to the Master of Health Administration, Jennifer has a Master of Science in Human Nutrition and is a Registered Dietitian.